Salmon is a hearty, oily fish ideal for a variety of cooking methods. The method to cook salmon can vary based on the type of flavor you would like to infuse in your dish. 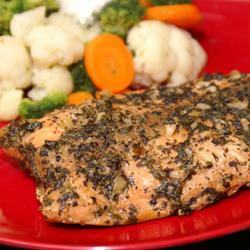 Salmon very versatile and is quite oil-rich and can vary greatly in texture and flavor. Fish in the salmon family include trout and char as well as a standard salmon. 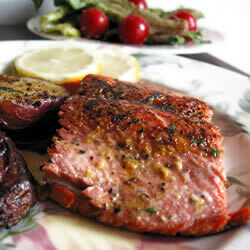 Atlantic salmon is one of the most common, consisting of a very deep orange, flaky flesh that has a very oily texture. The skin is silver and black with speckles and heavily scaled. This fish was originally common in rivers throughout Northern Europe but today it is less widely found. Conservationists recommend people avoid wild caught Atlantic salmon as the species is quite vulnerable and fish farming has a negative impact on the fish. Those that would like to consume salmon should seek out organic sources. These types of salmon can be purchased froze, fresh, whole or cut into steaks and fillets. You can also purchase smoked, hot and cold salmon. Ingredients: Four 6 ounce fillets of salmon, four lemon slices, two tablespoons of capers, two tablespoons of olive oil, 1/8 teaspoon of ground black pepper, one teaspoon of salt. Instructions: Place a heavy skillet on the stove and heat it to medium for 3 minutes. Cover the fish in olive oil and place it in the skillet, increasing the heat to high. Allow the fish to cook for three minutes then add the salt, pepper and capers. Turn over the fish and allow it to cook for another five minutes or until it has browned and the flesh flakes easily. Place each serving on a plate and garnish with lemon. Servings: Servings for this recipe will vary based on the size of the fillet you have purchased. 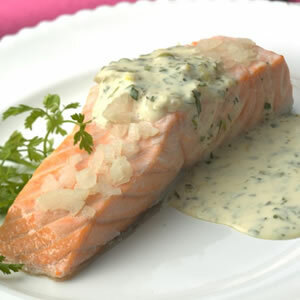 Ingredients : One salmon fillet, a half teaspoon freshly ground pepper, a half teaspoon salt, a wedge of lemon per serving. Instructions: Place an oven rack 7-8 inches from your broiler, set the broiler pan on this rack and allow it to preheat. Place the salmon on a piece of aluminum foil on your counter with the pink side up. Cover the fish in the olive oil, salt and pepper. Use an oven mitt to help you pull the rack holding the broiler pan forward so you can easily access it. Place the aluminum foil holding the salmon on the broiler pan and slide the rack back into the oven. Allow the salmon to cook for 10-15 minutes, checking it every 2 minutes to make sure it has not burned. Remove the fish from the oven, allow it to rest for a few minutes so the juices can redistribute and serve. 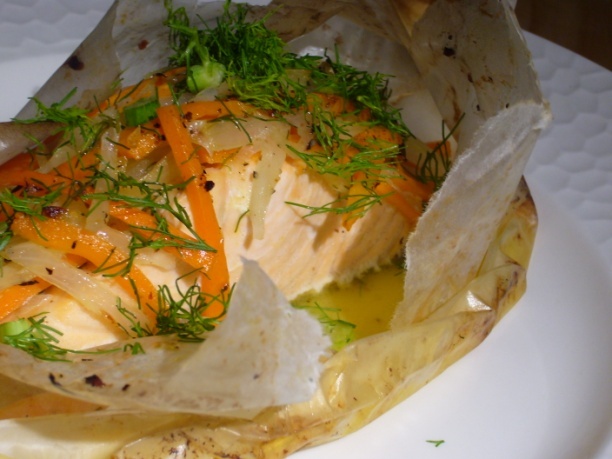 How to cook salmon？This recipe is rather easy and tasty. 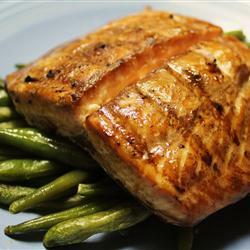 Ingredients: A pound of salmon fillets, three tablespoons plus 1.75 teaspoons brown sugar, three tablespoons plus 1.75 teaspoons soy sauce, three tablespoons plus 1.75 teaspoons water, two tablespoons and two teaspoons vegetable oil, lemon pepper, salt and garlic powder to taste. Instructions: Cover the salmon with the salt, lemon pepper and garlic powder. Combine the brown sugar, soy sauce, vegetable oil and water in a bowl, stirring until the sugar dissolves. Put your salmon in a zip-top plastic bag and cover in this mixture. Allow the fish to marinate for around two hours in the refrigerator. Meanwhile, preheat the grill to medium heat and oil the grates lightly. Place your salmon directly on the grates, discarding the excess marinade, and allow it to cook for 6-8 minutes on each side or until the flesh flakes easily. 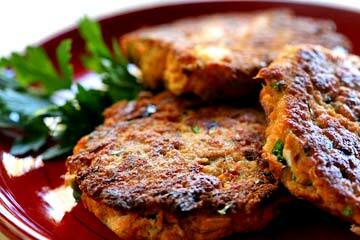 Ingredients: Two 6 ounce salmon fillets, a tablespoon lemon juice, a tablespoon chopped parsley, six tablespoons light olive oil, a teaspoon dry basil, two minced garlic cloves, a teaspoon pepper, a teaspoon salt. Instructions: Create a marinade by combining the olive oil garlic, lemon juice, parsley, basil, salt and pepper in a glass bowl. Place your fish in a glass baking dish and pour the marinade over the fillets. Allow the fish to marinade in the refrigerator for approximately one hour, turning the fish occasionally. 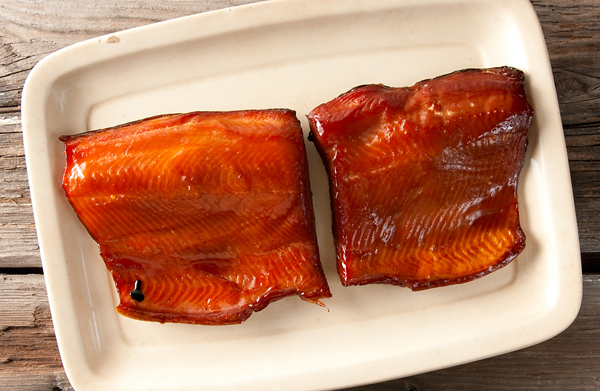 Place the marinated salmon on a piece of aluminum foil, pour the remaining marinade on top, and seal in a pouch. Place this pouch in a clean baking dish and allow it to cook in a 375 degree oven for 35-45 minutes or until the flesh flakes easily. 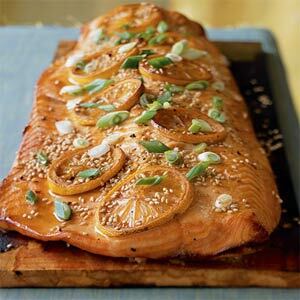 Ingredients: O ne untreated 24x8x1 cedar plank, six 4 ounce salmon fillets, sliced lemons, one large chopped red onion, a half cup extra virgin olive oil, a half tablespoon crushed black peppercorns. Instructions: Submerge the plank in water for 12-24 hours. When you are ready to cook, preheat your grill on high, place the plank on the grill and sprinkle the wood with the salt. Place your cover on the grill and allow the plank to heat for 2-3 minutes or until it is dry. Adjust the temperature to medium. Meanwhile, cover the salmon with olive oil and place it on the plank. Place the lemon slices, peppercorns and onion on top of the fish. Cover the salmon and allow it to cook for 10-12 minutes or until the flesh is opaque and easily flakes. How to cook salmon? This recipe adds the least extra calories. Ingredients: Two pounds of salmon fillets divided into four servings, a half cup water, a half cup dry white wine, two tablespoons of softened butter, 1.5 teaspoons of chopped garlic, 1.5 teaspoons of dried parsley, salt and pepper to taste. Instructions: Combine the water and wine and heat in a nonstick skillet for five minutes on medium high heat. Place the salmon in the poaching liquid and add the butter. Sprinkle the garlic, parsley, salt and pepper on top of the fish. Bring the liquid to a slow boil by reducing the heat to medium. Allow the fish to poach for 10-15 minutes or until it is firm. 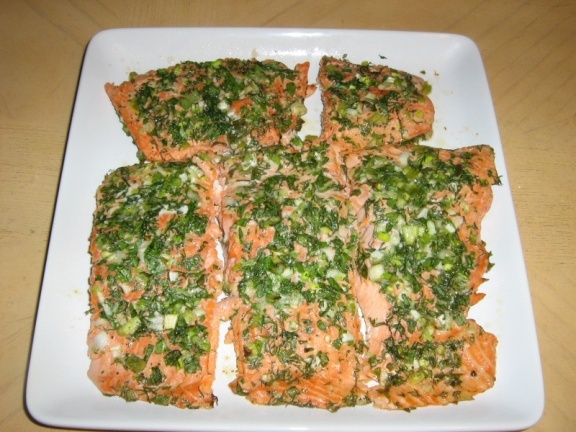 Ingredients: One 2-3 pound salmon fillet with the skin on, four tablespoons of unsalted butter, fresh chopped parsley to taste, ground pepper and coarse salt to taste. Instructions: Preheat your oven to 475 degrees F. Add the salt, pepper and butter to a baking sheet and place in the oven until the butter has melted. Remove the baking sheet from your oven and place the salmon in the butter with the skin side down. Season with additional salt and pepper. Place the fish in the oven for around 8-12 minutes or until the fish is cooked through and flake easily. Top with parsley and serve immediately. Servings: 20-30 depending on the size of the fillets used. Ingredients: Two large salmon fillets with the pin bones removed, a cup of kosher salt, a half cup dark brown sugar, a cup of sugar, a tablespoon of crushed black peppercorns. Instructions: Mix the brown sugar, sugar, pepper and salt in a bowl. 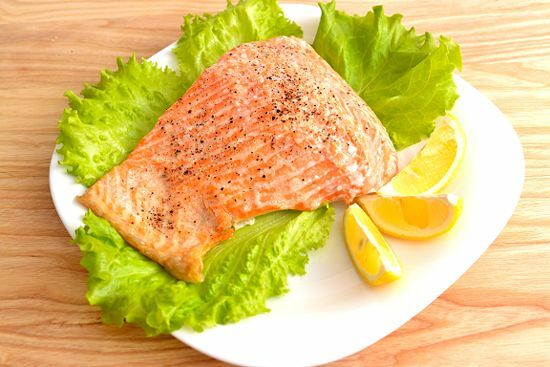 Lay the salmon on a layer of plastic wrap placed on a piece of aluminum foil slightly longer than your piece of fish. Rub a third of the sugar mixture on the fish, flip the fillet over and rub the remaining sugar mixture on the other side. Wrap the plastic wrap tightly around the fish and place the fish on top of a sheet pan, covering the fish with an additional sheet pan. Place weights, bricks or a phone book on top of the top pan and leave the salmon in the refrigerator for 12 hours, then turn the fish over and refrigerate for another 12 hours. Make sure there is a place for runoff juices from the fish to gather. The next day, unwrap the fish and rinse off the remaining cure under cold water, patting the salmon dry. Place the salmon in a dry, cool place other than your refrigerator and leave it here for 1-3 hours or until the fish is matte-like and dry. You may need to use a fan if your home is humid. Place the fish in a smoker with sawdust or hardwood chips set to 150-160 degrees F. Cook the fish until the flesh registers 150 degrees F on a food thermometer and serve. 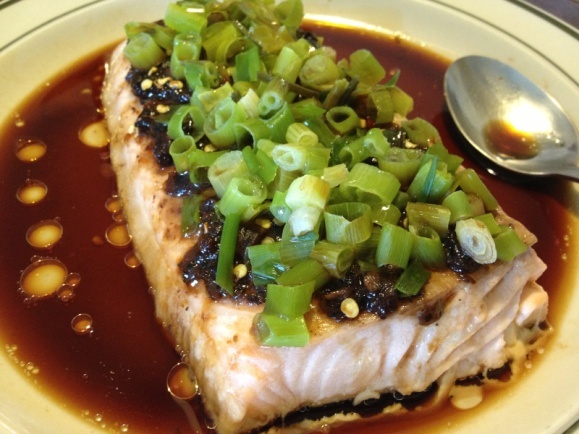 Ingredients: Two 1 pound fillets of salmon, two teaspoons of sesame oil, four slices of ginger, a lemon, two scallions sliced into four inch pieces, a tablespoon of soy sauce, a fourth teaspoon salt and 1/8 teaspoon of white pepper. Instructions: Rinse the salmon under cold water and pat it dry. Place the fish in a shallow 9-inch heatproof bowl and cover in the salt, pepper and soy sauce. Sprinkle the ginger and scallions on the dish. Cut half the lemon into slices and place them over the fish and squeeze the juice from the remaining half onto fish as well. Place a one-inch high steaming rack in a 14 inch wok with a flat bottom. Fill the wok with water up to the ¾ inch mark on the steamer and bring the water to a boil. Place the bowl containing the salmon on the steamer for 8-10 minutes or until the fish begins to flake when poked. Replenish the water during this time as necessary. Drizzle the cooked salmon with sesame oil and serve. Ingredients: Two 5-6 ounce boned salmon fillets, a lemon, a small boiled white potato cut into thin slices, two sprigs of dill, two tablespoons white vermouth, 1.5 tablespoons of butter, salt to taste. Instructions: Heat your oven to 375 degrees F. Boil the potato slices until tender and season with salt. Cut half the lemon into four slices and juice the remaining half into the white wine. Place the salmon on a sheet of parchment paper and sprinkle with the salt and pepper, dotting the fish with pieces of the butter. Place the potato slices and dill on top of the salmon, seasoning with salt and pepper once more. Place the lemon on top of these layers. Seal the parchment paper into an envelope, leaving an opening at the pointed end. Pour the lemon and wine combination into this opening and seal the envelope completely. Bake these bundles in the oven for 11-12 minutes and consume. Ingredients: One undrained can of flaked salmon, a shredded slice of bread, one minced medium garlic clove, three tablespoons of chopped green onion, three tablespoons of green bell pepper that is minced, a tablespoon of fresh dill or a teaspoon of dried dill, an egg, a tablespoon of flour, three tablespoons of vegetable oil, a half teaspoon sweet paprika, a teaspoon salt, ground black pepper to taste. Instructions: Mix the salmon, green onion, bread, egg, bell pepper, flour, dill, garlic, salt, pepper and paprika in a large bowl. Scoop the mixture into eight patties approximately half an inch thick. Heat the oil in a skillet on medium high heat. Cook the patties in the oil for about 3-4 minutes each side until both sized are browned. Serve immediately. Hope you have a better idea of how to cook salmon now.